CONGRATULATIONS! You've made it through!! We are finally on the last lesson which is basically a wrap up of everything. I am so proud of you for being persistent in this study for I know that it has been difficult for some. His kindness leads us to repentance (Romans 2:4) has been a key as we have allowed our minds and hearts to go to some deep places. It’s been because of God’s kindness & mercy that we even have the courage to release the painful circumstances to Him. Now, I know this particular verse references repentance, but it seems that forgiveness is often intertwined with it. 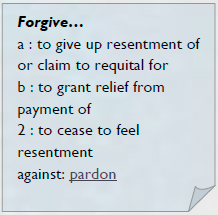 For unless we forgive quickly, we usually have some confessing to do for hanging on to our grievances. When I hang on to unforgiveness, I usually end up having to repent for anger and negative words spoken about others among other things. What I have laid out for you today is an organized summary of what we have studied so that you can take these principles and apply them to your own life with the help of a close friend, or lead someone else through them with knowledge and understanding of the Word. I have personally used this format with several people who have been asking for freedom from past hurts. They have also been ready to release things to God. Even though forgiveness comes down to an issue of obedience, we never want to rush someone or pressure them into doing something they are not asking for. Allow the Holy Spirit to be that voice in their lives. He will bring things about in the right time. So, my friends, be blessed today as you open the door and allow Jesus to come into your situation. Get to know the kindness of our Saviour. Study the justice & righteousness of God. Accept His love & sovereignty. Go through the following process and pray this prayer along-side a trusted friend. Let them be there to support you as you may be surprised by the emotion that is released (don’t forget the Kleenex). Let them pray over you to confirm the Confessions that you make. Above all – Trust God! He is Faithful to deliver you and set you free from your past through the Door of Forgiveness. What a Great God we serve and have full access to!!! Be strong & courageous, my friend (Joshua 23:6). Open with a declaration of trust in God and worship Him. Admit the pain that’s been caused and the general circumstance. You do not need to go into great detail, just what comes to mind as the main cause of the hurt. You may want to actually say what they have done – but I emphasize, use nutshell versions of circumstances. Hear the words of Jesus on the cross as He said this very thing to those who put Him to death. He asked His Father to forgive His perpetrators because they did not know what they were doing. Think about it; can any of us really know the ramifications of our actions, the domino effect of our choices even to generations to come? I don’t think so. We can’t even count the hair on our head, let alone know what tomorrow’s responses will be. Use the words of Jesus when you pray this step. Allow the Holy Spirit to come and pay back the bank of your soul, so to speak, to fill up all of those places that were once occupied by the wounding and damage done by the past. That you will trust God and His ability to handle everything for you. Galatians 6:1 BRETHREN, IF any person is overtaken in misconduct or sin of any sort, you who are spiritual [who are responsive to and controlled by the Spirit] should set him right and restore and reinstate him, without any sense of superiority and with all gentleness, keeping an attentive eye on yourself, lest you should be tempted also. Psalm 94:17 Unless the LORD had given me help, I would soon have dwelt in the silence of death. Deuteronomy 32:35 Vengeance is Mine, and recompense, in the time when their foot shall slide; for the day of their disaster is at hand and their doom comes speedily. Luke 23:34 And Jesus prayed, Father, forgive them, for they know not what they do. And they divided His garments and distributed them by casting lots for them. Psalm 32:5 Then I acknowledged my sin to you and did not cover up my iniquity. I said, "I will confess my transgressions to the LORD "—and you forgave the guilt of my sin. Joel 2:25 And I will restore or replace for you the years that the locust has eaten--the hopping locust, the stripping locust, and the crawling locust, My great army which I sent among you. Isaiah 53:5 But He was wounded for our transgressions, He was bruised for our guilt and iniquities; the chastisement [needful to obtain] peace and well-being for us was upon Him, and with the stripes [that wounded] Him we are healed and made whole. John 20:22 And having said this, He breathed on them and said to them, Receive the Holy Spirit! Matthew 11:28-30 Come to Me, all you who labour and are heavy-laden and overburdened, and I will cause you to rest. [I will ease and relieve and refresh your souls.] Take My yoke upon you and learn of Me, for I am gentle (meek) and humble (lowly) in heart, and you will find rest (relief and ease and refreshment and [recreation and blessed quiet) for your souls. My yoke is wholesome (useful, [good--not harsh, hard, sharp, or pressing, but comfortable, gracious, and pleasant), and My burden is light and easy to be borne.